Currently in use with various military and law enforcement acencies, Knights Armament Micro Flip Up Sights are built to exacting tolerances that ensure zero is maintained even in the harshest conditions. 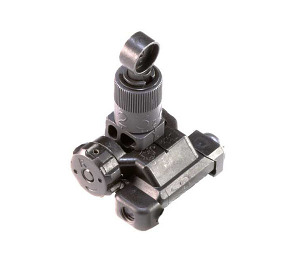 In addition, Knights Micro Sights have one of the lowest profile top-rail footprints in the industry. Knights 600M Micro Rear Flip Up Sight that mounts to any M1913 Picatinny rail system. Features 200-600 meter elevation adjustments.